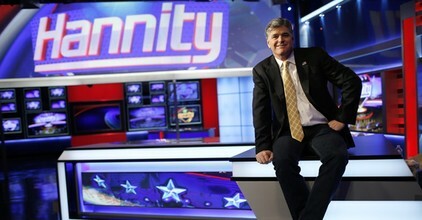 As Sean Hannity hyped a conspiracy theory about the murder of a Democratic National Committee staffer last week, touting it with the zeal of a true believer without citing evidence that justified that belief, the combative Fox News host declared himself under fire and in need of backup. Lashing out at what he called "Twitter snowflakes" and "the liberal effort to silence me," he took particular umbrage at a campaign by the progressive group Media Matters for America to pressure his advertisers, an effort he called liberal fascism. "They hope to get me fired," he wrote. "Rush, O'Reilly, Beck, Imus, & now me." He may succeed in rallying his fans. But Hannity's angry claims elide the fact that the progressives at Media Matters have sought the scalps of conservatives like him for more than a decade. The Media Matters website has 3,488 items tagged "Hannity" dating back to 2006. Its latest push isn't the reason his position is as precarious as it has ever been (nor did Media Matters stop Bill O'Reilly, who was sunk by multiple "falafel talk" allegations, or Rush Limbaugh, who is still on the air).